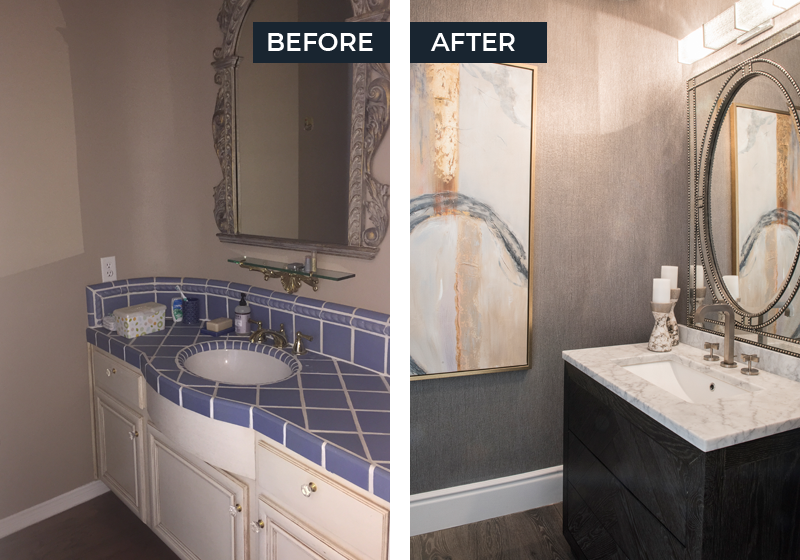 A beautifully remodeled bathroom is closer to reality than you think. 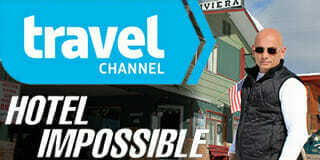 Let the trusted, reliable and dependable team at Mr. Build Construction handle everything – from design to installation, we’ve got you. FINALLY, BATHROOM REMODEL CONTRACTORS YOU CAN TRUST. Mr. 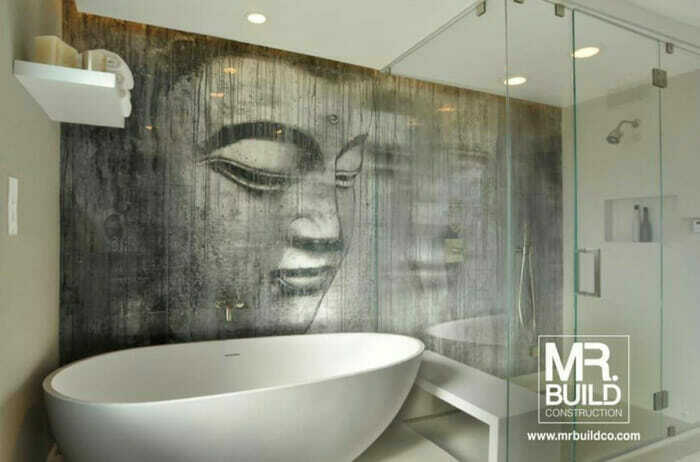 Build understands the importance of a personable, functional and comfortable bathroom. We also understand that getting from the bathroom you have now to something better is not necessarily easy, or pain-free. But we believe that remodeling your bathroom needn't be difficult or involve pain. We've remodeled every conceivable style and design of bathrooms, and we've done so while sticking to our promises of reliability, dependability and honesty. It's the reason we have 100+ 5-star reviews on sites like Yelp and Houzz combined. In addition, all our contractors are fully licensed, fully ensured, and bring to your home, a track record for exceptional customer service. At the free consultation, we ask certain important questions to try and find out what your needs are. Notes are recorded on the size, color, and any particular design requirements you may have. This is the stage of the process where you get the chance to tell us exactly what you want so it is never rushed. We won’t move on to the next step until you confirm fully what is you are trying to achieve. By doing this we make sure we deliver precisely what it is you have as a goal. Once we’ve spent the time to find out your full needs and the scope of work, we draw up a quote. We are always fair and open about the quotes we provide. Trust and honesty are key things in our quotation process. Our quote is almost always good for the entire execution of the project. We stick to our quotes because the trust we build with our clients is far more important than money. 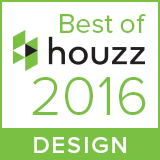 We work with the best, award-winning interior designers in Orange County and Los Angeles. By working with only the best designers, we ensure that your project is of a high quality, stunning and functional. Already have a designer? Not a problem! We can work with them to remodel your room in the best way. This is where we begin the process of turning your dream into a reality. Layer by layer, we assemble the pieces to the final product; all materials, accessories and design elements are skillfully and professionally put together at a pace consistent with the goals established earlier. The entire installation process is overseen by a well-trained, professional project manager. Does Mr. Build Have a Consultation Process, and Is It Free? Before we do anything we’ll always start our engagement with you on a free, no-hassle consultation. This is the stage that we gauge your expectations and goals, noting carefully what we must do from our end to deliver your bathroom dream. Our consultation team will give you all the necessary information and guidance for selecting the most workable bathroom remodeling solution. This consultation is never rushed so you’ll never feel pressured into making a decision. How Reliable Are Your Quotes? We recognize that standard quotations for a bathroom remodel are a constant source of contention. This is why we operate on the premise that a quote should be fair, open, and above all reliable. Reliable for us means that once we draw up a quote, that quote is always good for the life of the project. Do You Work With High-Quality Designers? If you are looking for an orange county bathroom remodel that is developed with the help an award-winning designer then Mr. Build is able to help. We work with some of the top designers in the area to ensure that your finished project is of the highest standards. Our design partners are known in Orange County and Los Angeles for designing functional, contemporary and beautiful bathrooms. What If I Already Have A Designer? Often, we encounter clients who have their own designer in mind. We never try to impose and will always work with a client-specified designer. We will work with your designer in much the same way we work with ours: open and honest communication with a strong emphasis upon the desires of you, the client. Will There Much Disruption During The Process? As much as we’d like to promise zero disruption during the remodeling process, we are, unfortunately, unable to do so. But what we can promise is that we’ll minimize disruptions as best as we can. Depending on the scope of work (i.e. full custom homes), we may not be able to completely minimize noise levels or the shuffling around of materials and fixtures. But everything will always be back in its place at the end of the project and we’ll always work as fast as we can to reduce the risk of extended noise levels. How Will My Pets Be Affected? We understand that some clients will own pets that require consideration during a bathroom renovation. Because of this we develop specialized systems and procedures for carrying out the work with minimal impact on your pets, if any. These systems and procedures include design features too. That way your pets can fully adjust to your newly remodeled bathroom without the need for any extensive retraining or readjustments. Our bathroom remodeling contractors service all of Orange County and Los Angeles, including but not limited to: Aliso Viejo, Brea, Costa Mesa, Huntington Beach, Irvine, Laguna Hills, Laguna Niguel, Mission Viejo, Newport Beach, Newport Coast, Placentia, San Clemente, San Juan Capistrano, Villa Park, Yorba Linda, Agoura Hills, Beverly Hills, Burbank, Calabasas, Culver City, Downey, Glendale, Hermosa Beach, Lakewood, Long Beach, Los Angeles, Malibu, Manhattan Beach, Marina Del Rey, Mission Hills, Pacific Palisades, Palos Verdes Peninsula, Pasadena, Playa Del Rey, Playa Vista, Rancho Palos Verdes, Redondo Beach, Santa Monica, Sherman Oaks, Signal Hill, Studio City, Sun Valley, Venice, West Hollywood and Woodland Hills and more areas in Southern California. What About Permits for a Project? There are some bathroom renovations that are very minimal in terms of what is done. These types of projects can typically be done without the need for any type of building or renovation permit (i.e. switching out a bathtub, or changing out the flooring). Some projects, on the other hand, are extensive. When these projects which entail structural changes to a bathroom remodel or undertaken, a permit will usually have to be in place before work begins. You never have to worry about the hassle of applying for permits because Mr. Build takes care of that side of things. We assess and evaluate the necessary scope of work for large structural remodels and put in the necessary paperwork to have the projects approved. Are There Any Pre-Project Tasks To Be Done By Me? 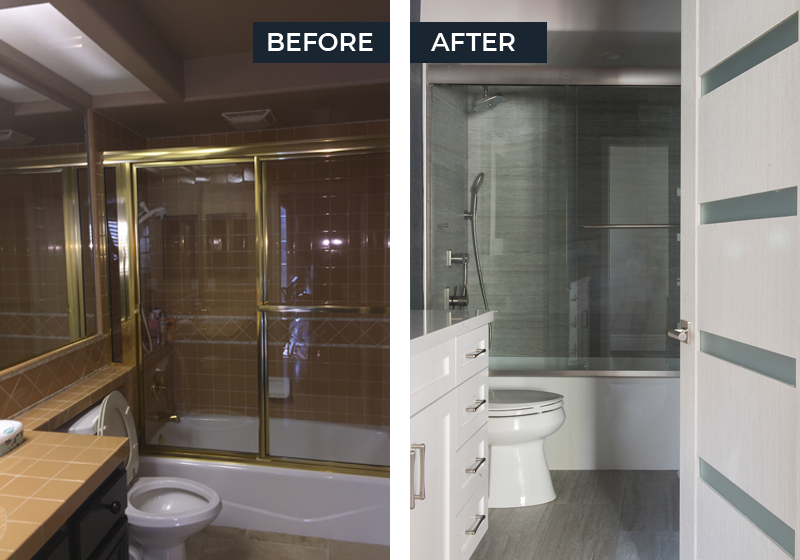 A typical Irvine bathroom remodel will involve some element of pre-project work from the standpoint of the client. But this is nothing that should bother you since it amounts to the standard routine preparation before our work personnel move in to commence working on your bathroom. So, this will typically involve moving your personal effects out the way. You’ll also need to cover those items of furniture that may be in close proximity to the work site. Aside from these preliminaries, you typically won’t have to do much before we come into start your bathroom remodel. Are Your Contractors Fully Licensed? All contractors used by Mr. Build are fully licensed and fully insured. This allows us to deliver high quality bathroom remodels whilst providing clients with peace of mind and the assurance that they are protected. In addition to bathrooms, are contractors are also capable of kitchen remodels, new room additions and more. Does Mr. Build Provide On-Site Management? Our contractors are always overseen by a highly trained and professional project manager. 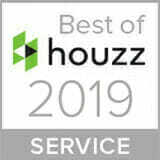 This is the expert eyes and ears that help ensure that your remodel stays on budget and remains within the timetable established at the start of the consultation process. Happy clients have left over 100+ 5-star reviews for Mr. Build on both Yelp and Houzz. Many of these reviews are breathtaking bathroom remodels in Irvine, Newport Beach, Malibu and more. The positive feedback we receive helps us to maintain our commitment to quality, dependability and honesty. Can You Handle Unconventional Remodels? Our bathroom remodeling experience is quite extensive and this has given the breadth of knowledge to undertake even the most unconventional bathroom remodel. 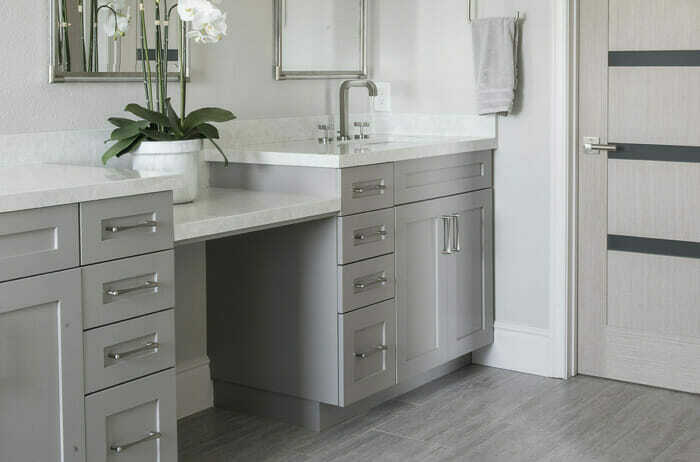 Whether you are looking to incorporate plants, non-traditional bathroom fixtures, or re-configuring a traditional layout, we can help transform any remodeling dream into concrete reality. All our bathroom remodels and renovations come with a guarantee. This means that you can be rest assured about the quality of your new bathroom with the added peace of mind of having things put right down the road. Our warranty period is one of the best in the industry and is a big part of why we confidently promise to deliver at the highest level. 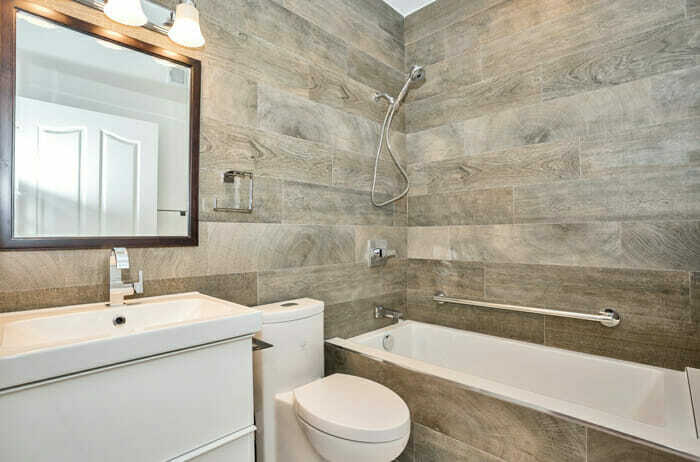 We understand that our clients are busy people who want to get their bathroom renovations in Orange County and LA done as quickly and as efficiently as possible. This understanding has helped to shape our delivery process, a part of which is the rigid adherence to time frames set. We listen carefully at the start of the consultation process, ensuring that expectations are set in a realistic way. Once we start working we get on with the project, pressing forward diligently to deliver on or before time. We’ve never had to deal with stern formal complaints from clients but nonetheless we’ve put in a place a system to handle anything that comes up. Our complaints procedure is transparent and always focused on listening to, and addressing the client’s concerns. Your first point of contact is the dedicated project manager set to oversee the project, but clients can call or email us directly for help in sorting out any issues. What Is Your Post Installation Service Like? Once your bathroom remodeling project is finished, we do apply the final touches, ensuring that everything is in its proper place. All work materials are cleared and we check to make sure everything looks the way you want it and works the way they should. In the early days and weeks after installation we remain on hand to handle any concerns that you may have. Should anything develop unexpectedly, we will send out a team or a representative to take a look as soon as possible. We are located in Orange County but we also serve Los Angeles. We are the best contractors in Irvine. Located at 18100 Von Karman, Ste 850 Irvine, CA 92612, Mr. Build Construction will help you make your dream come true. We are open Monday through Friday from 9 AM to 6 PM. You can give us a call at 949-705-4534. You can see our reviews on Houzz and Yelp. If you want to get from the John Wayne Airport (SNA) to our offices in Irvine, follow these simple and easy directions. When you are ready to leave the John Wayne Airport (SNA) Head west and use the left lane to stay left at the fork. Follow signs for Airport/Macarthur Boulevard South. Use the left lane to turn left onto Macarthur Boulevard and use the left two lanes to Michelson Drive. Turn left onto Von Karman Avenue and turn right onto Quartz. Turn left and then follow it up with a slight right and our office will be on your right side located at 18100 Von Karman. Ami's crew is professional, always on time and most importantly, the quality of work they do is second to none. In the construction world, there's always unexpected surprises. But that's where Mr Build truly stands out -- Ami is always there to make sure any issues or needs are taken care of promptly and professionally. The project supervisor was at my house everyday and in contact with me on a daily basis. He provided great advice when we shopped for materials (i.e tiles). I am very impressed with the end result and would highly recommend Mr. Build to anyone. Mr. Build will be starting on my 2nd bathroom renovation soon.